The Pomona Police Department Traffic Services Bureau will be conducting a DUI/Drivers License Checkpoint on 1-18-19 at an undisclosed location within the city limits between the hours of 9 PM to 3 AM. We will also be deploying this weekend to stop and arrest alcohol and drug-impaired drivers in the Department’s ongoing traffic safety campaign. DUI Saturation Patrols will deploy on 1-18-19 between the hours of 7 PM and 3 AM in areas with high frequencies of DUI collisions and/or arrests. In recent years, California has seen a disturbing increase in drug-impaired driving crashes. Pomona PD supports the new effort from the Office of Traffic Safety that aims to educate all drivers that “DUI Doesn’t Just Mean Booze.” If you take prescription drugs, particularly those with a driving or operating machinery warning on the label, you might be impaired enough to get a DUI. Marijuana can also be impairing, especially in combination with alcohol or other drugs, and can result in a DUI. In California, alcohol involved collisions led to 1,155 deaths and nearly 24,000 serious injuries in 2014 because someone failed to designate a sober driver. Over the course of the past three years Pomona PD officers have investigated 115 DUI collisions which have claimed 10 lives and resulted in another 150 injuries. 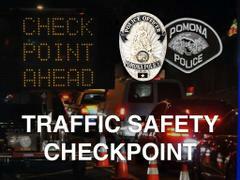 Funding for this checkpoint is provided to Pomona Police Department by a grant from the California Office of Traffic Safety, through the National Highway Traffic Safety Administration, reminding everyone to ‘Report Drunk Driver – Call 9-1-1’.